Work with your Coach to help reduce your personal errors by playing to your strengths and improving your weaknesses. 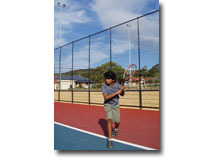 Hit the ball with more topspin to get more height over the net to stop the net getting in the way. This will give you a greater margin of error and more balls will go into court. When you are under pressure during a rally don't go for the winner but aim the shot high, deep and generally crosscourt to give you a chance to recover your position on court. During a rally play safe by hitting the ball back in the same direction and only change the direction when you have time to get into good position to control the ball. Good footwork and preparation are the key to getting into the correct position. This will help you reduce errors and improve your consistency. When you have improved your game so that you can hit the ball over the net consistently and have reduced your unforced errors you can develop a plan to force your opponent into making errors. Rally the ball from side to side to make your opponent run forcing him/her to hit the ball under pressure. This will tire your opponent and hopefully result in a number of short balls which you can then hit into the open court for a winner. Your opponent will start to over anticipate your side to side shots moving very early to the other side of the court so that you will be able to hit the ball back to the same side or behind them. Learn to hit the ball so that it lands in the service box but is angled so that it crosses the sideline moving your opponent wide off the court leaving the court open for the easy put away. When rallying the ball don't let your opponent get into a rhythm use topspin and slice to allow you to vary the pace of the ball as well as the bounce of the ball at the other end of the court. This will also allow you to vary the length and width on your shots. The high loopy ball to your opponent's backhand for example is a great shot as it will on most occasions allow you to put away the short ball or hit a short ball as a follow up. When preparing for a Club match or tournament you should if possible watch your next opponent play in a match or at training so that you get an idea of how he/she plays and see if you can determine any weaknesses. The key to improving your game is to reduce your errors and use your strengths to exploit your opponents weaknesses. Enjoy playing tennis, the game of a lifetime.